Story by Kellie Tannock, WGAC media adviser, Tom Vigilante, Wunambal Gaambera Aboriginal Corporation and Bush Heritage Australia and Cristina Lasch, TNC and CCNet Operations Coordinator. In early May this year, at the Conservation Coaches Network (CCNet) Rally, in the Blue Mountains, New South Wales, Australia, the Wunambal Gaambera people of the North Kimberley were recognised by the global CCNet community and CCNet Australia for their outstanding contribution to conservation practice. Their leadership has been instrumental in adapting the Healthy Country Planning process and their example as caretakers of ancestral Country is an inspiration. 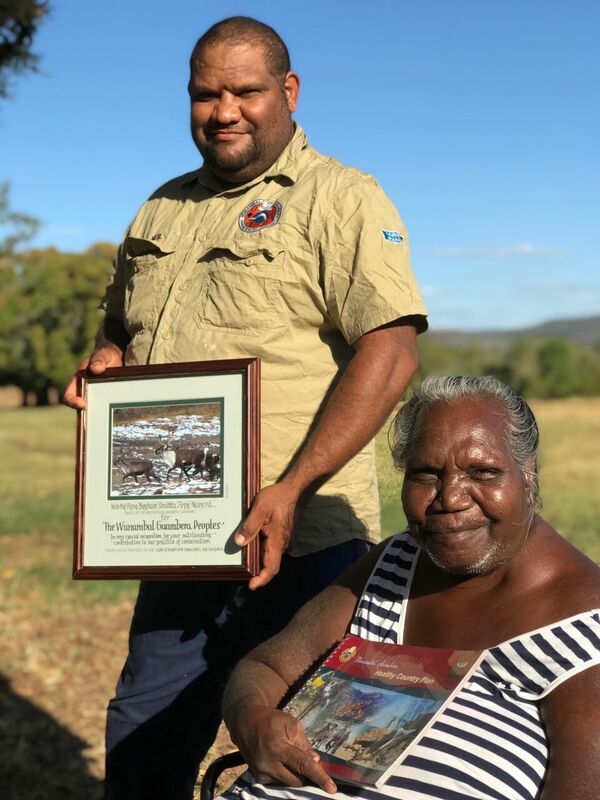 Head Uunguu Ranger Neil Waina holds the CCNet award while senior Wunambal Gaambera Aboriginal Corporation director Diana Williams shows their Healthy Country Plan. Photo by Tom Vigilante, Wunambal Gaambera/Bush Heritage Australia. In 2006, the Wunambal Gaambera Aboriginal Corporation (WGAC), in partnership with Bush Heritage Australia, developed and subsequently implemented the world’s first “Healthy Country Plan” – a community-owned plan for Wunambal Gaambera people and Country. Other key partners in this effort were the Kimberley Land Council (KLC), the regional Traditional Owner representative body, and the Australian Government’s Indigenous Protected Area (IPA) and Working on Country programs. Wunambal Gaambera people are the Native Title holders for 2.5 million hectares of North Kimberley land and sea. Developed and owned by the community, the Wunambal Gaambera Healthy Country Plan covers the full extent of Wunambal Gaambera Country regardless of tenure, and is really as much a plan for people as it is for country. The Wunambal Gaambera people know that if their country is healthy, then they will be healthy. ‘Country’ is an Aboriginal English term that refers to how Indigenous Australians understand and relate to their ancestral territory. WGAC’s Uunguu Rangers manage the area according to the Healthy Country Plan, which looks after important targets such as people, culture and cultural places, animals, plants, waterholes, and Right Way Fire. After developing the plan, WGAC wanted to make sure it was used to guide its work. This led to the establishment of the ground-breaking Uunguu Monitoring and Evaluation Committee which meets every year to review the plan and make changes wherever needed to stay on track. In 2015 WGAC was half-way through its 10-year plan, undertaking a mid-term review which also became a model for other groups. Through this work WGAC has been a trailblazer in conservation planning, providing approaches and tools to share with other indigenous groups around Australia. Thanks to WGAC and several dedicated conservation practitioners and organisations in Australia, today Healthy Country Planning (HCP) is a recognised adaptation of the Open Standards and has become the model for some 30 similar plans adopted by Indigenous groups around Australia and other places such as Canada. The HCP process guides project teams to identify effective conservation strategies and provides an objective, consistent, and transparent accounting of conservation actions and the intended and actual outcomes of conservation projects in a cultural landscape and cross-cultural context. It enables project staff to responsively adapt their actions to improve strategy effectiveness and achieve greater impact. WGAC chairperson Catherine Goonack said Wunambal Gaambera people were proud to be recognised as conservation leaders, but also to have taken an early opportunity to continue looking after their ancestors’ Country to global standards for generations to come.